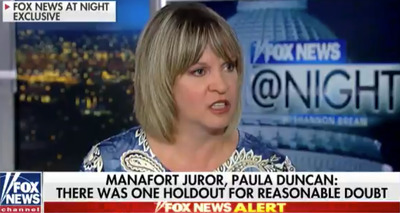 Fox NewsPaula Duncan, one of the jurors from Paul Manafort’s trial. A juror who participated in the trial of the former Trump campaign chairman Paul Manafort says just one holdout prevented the jury from convicting Manafort on all 18 of the federal charges he faced. The jury found Manafort guilty on eight counts of bank fraud, tax fraud, and failure to disclose a foreign account. The judge in the case declared a mistrial on the remaining 10 charges. “We all tried to convince her to look at the paper trail – we laid it out in front of her again and again,” Duncan said of the holdout juror. Duncan also described the room in which the jurors, some of whom she said were emotional, deliberated Manafort’s case. “Crazily enough, there were even tears,” she said. A juror who participated in the trial of the former Trump campaign chairman Paul Manafort says just one holdout prevented the jury from convicting Manafort of all 18 of the federal criminal charges he faced. In a Fox News interview on Wednesday, Paula Duncan, a self-described Trump supporter, said the juror, who has not been publicly identified, was not convinced that Manafort was guilty of all the charges. “We all tried to convince her to look at the paper trail – we laid it out in front of her again and again,” Duncan said during an interview with the Fox News host Shannon Bream. Manafort was convicted of eight counts – five of tax fraud, two of bank fraud, and one of failure to report a foreign bank account. The judge declared a mistrial on the remaining 10 counts. Duncan said it was the holdout who prompted the jury to send a note to Judge T.S. Ellis asking for an explanation of the term “reasonable doubt,” the standard of proof in US criminal trials. The interview Wednesday night marked the first time a juror had publicly identified him or herself after the trial. Ellis had cautioned against publicizing the juror’s identities, citing the high-profile nature of the case. Ellis previously said he had personally received “criticism and threats” while presiding over the trial. Asked whether she thought any of the jurors’ personal political views influenced their decision, Duncan said she did not believe so. Duncan also described the room in which the jurors, some of whom she said were emotional, deliberated Manafort’s case. “Crazily enough, there were even tears,” Duncan said. Manafort was indicted as part of the special counsel investigation into Russian election interference, though his charges were unrelated to his work for the Trump campaign. Manafort is scheduled to face a new judge and jury in another trial in September on charges that include obstructing justice and failing to register as a foreign agent. In several tweets on Wednesday morning, Trump referred to Manafort as “a brave man” and contrasted his behaviour with that of Michael Cohen, Trump’s longtime personal attorney who implicated Trump as a participant in crimes to which Cohen pleaded guilty a day earlier. Rudy Giuliani, Trump’s attorney, reportedly told The New York Times that he and Trump had discussed the pros and cons of pardoning Manafort. The Times said Giuliani echoed Trump’s assertion that Manafort was treated “horribly” by the justice system.